Naval Air Station Oceana is the East Coast's Master Jet Base, located in Virginia Beach, Virginia. 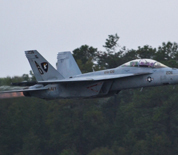 It serves as the home port to Strike Fighter Wing Atlantic and hosts four Carrier Air Wings - Carrier Air Wing One, Carrier Air Wing Three, Carrier Air Wing Seven and Carrier Air Wing Eight. There are approximately 17 squadrons at Oceana flying the F/A-18 Hornet Strike Fighter. The base is also home to the Strike Fighter Weapons School Atlantic which provides graduate level flight instruction to the local squadrons. An Oceana Navy Reserve squadron, Fleet Logistics Support Squadron VR-56, flies the C-9 Skytrain II to provide worldwide airlift support. This NAS Oceana directory features the critical info you’ll need to navigate through the many facilities and recreational opportunities available on base.